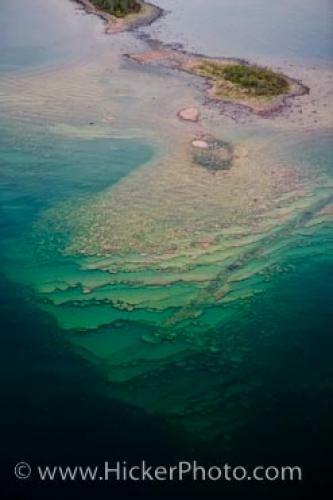 The water is so clear and blue that when taking a flight from Thunder Bay over the small islands in Lake Superior that you can see right through to the rocks underneath the islands - it is a stunning aerial view. Lake Superior, the largest of all the Great Lakes, is also the largest freshwater lake in the world in terms of surface area, and the third-largest due to volume. It is also the deepest and coldest of the Great Lakes. There are a number of islands in Lake Superior, one of which can be seen in this aerial view. Superior, Thunder Bay, Ontario, Canada. An example of this movement around the lake was the Wisconsin glaciation that happened about 10,000 years ago. Ice covered the entire lake and as the ice retreated it left all the contours and ridges that exist today. Rocks would have moved and formed during shifting, and some of that evidence can be seen below the surface of the water. Due to a lack of pollution and contamination so far, the water is still clear enough to see below the surface of the water to the base of the islands where from an aerial perspective one can see the shelves of the rock. Aerial view of small rocky Islands with a clear view through the water to the rocks below in Lake Superior during a flight from Thunder Bay, Ontario, Canada. I photographed this photo with the digital SLR camera model Canon EOS-1Ds Mark III, aperture of f/3.5, exposure time of 1/320 sec. on ISO 200, as always I used a original Canon Lens, the focus lenght for this picture was 70mm.